Spiral notebooks are one of the favorite stationeries for journalists, people who always take notes, and artists. If you are a DIY lover you can create your own custom spiral notebook that reflects your personality. All you need is a bunch of properly punched papers and a spiral binding coil. You can add as much paper as you want and can choose any spiral coil color. If you are designing your own custom spiral notebooks and love to share or to sell them, these spiral notebook mockups will come in handy for you. The biggest advantage of the spiral notebook is you can turn the pages up to 360-degrees so that you can get more on-page real estate. You can even tear the unwanted pages easily and keep your notes error-free. The spiral notebooks come in different sizes and even come in a vertical orientation. In this list of spiral notebook mockups, we have managed to collect all the famous spiral notebook category. 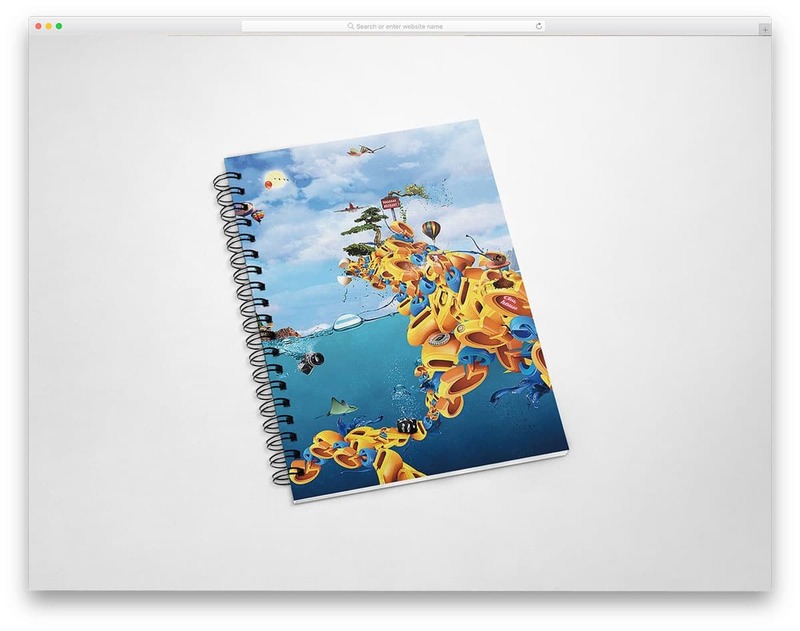 Artists who love to travel and capture the life with their art also prefer spiral notebooks; for them, we have even collected landscape style big spiral notebook mockups. Just pick the mockup you want and showcase your design elegantly with it. This mockup set has an A5 sized notebook in its package. The designer of this mockup gives you the freedom to customize almost every element on the spiral notebook. You not only allowed to change the front and back cover of the notebook but also can change the color of the spiral coil. The designer also gave you the option to add your foil stamp if you want to brand your spiral notebook design. Papers inside the notebook can also be shown in this mockup. 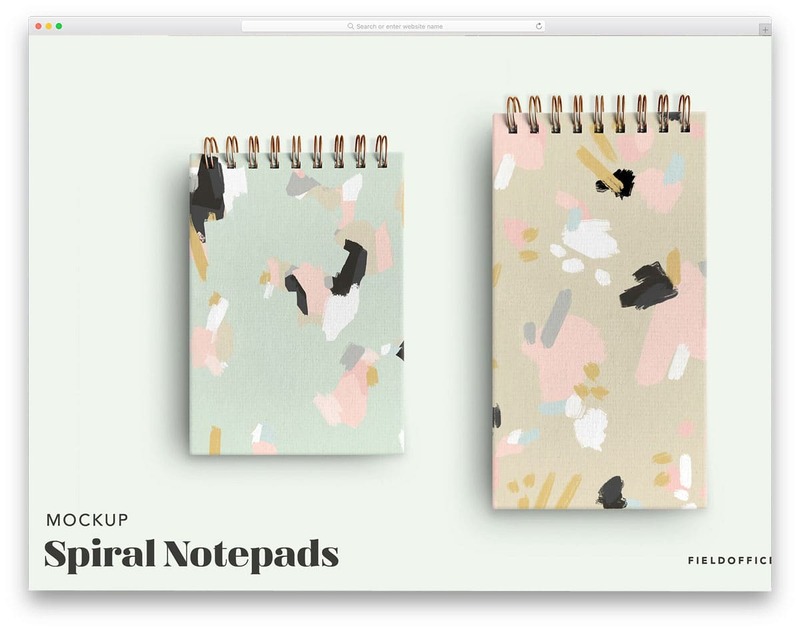 If you are using this mockup to create a product image, you can show what type of paper you are using in your spiral notebook. This mockup includes a regular sized A4 notebook in its package. You don’t get tons of customization options as you got on the previous mockup set. With this mockup, you can show the front and back cover design of the notebook. Some creatives used to have continuous images on the front and back cover. If you are making a design like it, this mockup has an image that shows the front and back cover simultaneously. 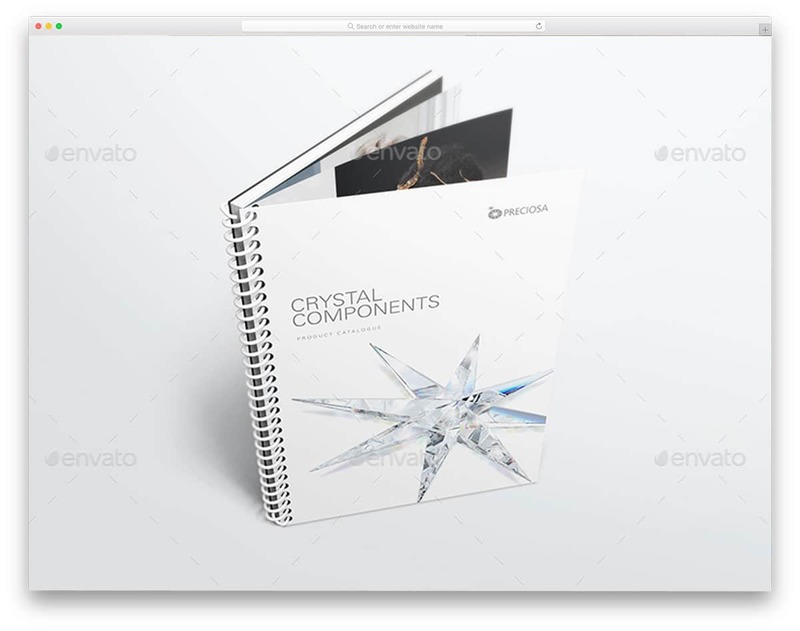 The shadows of the book and the spirals on the pages give a realistic look to your mockup. 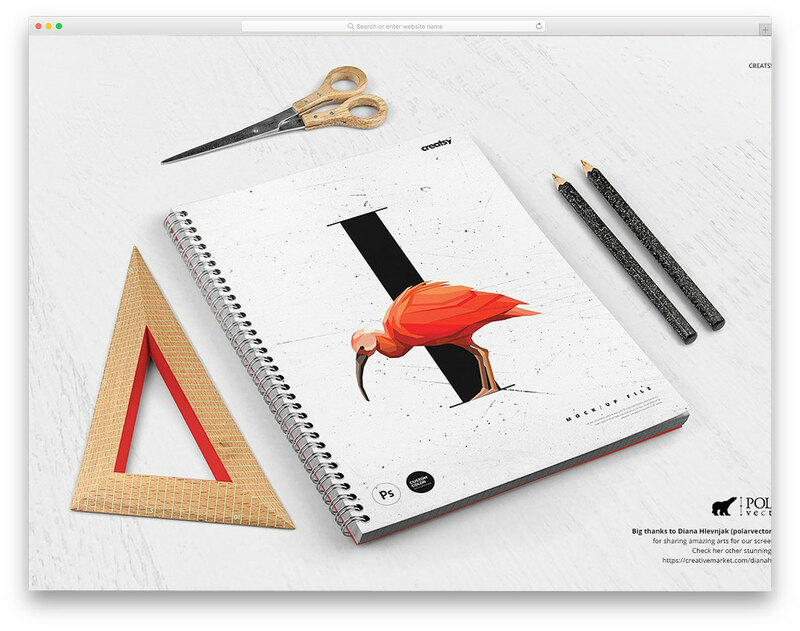 An open notebook image is also included in the package to help you show what type of paper you are using. 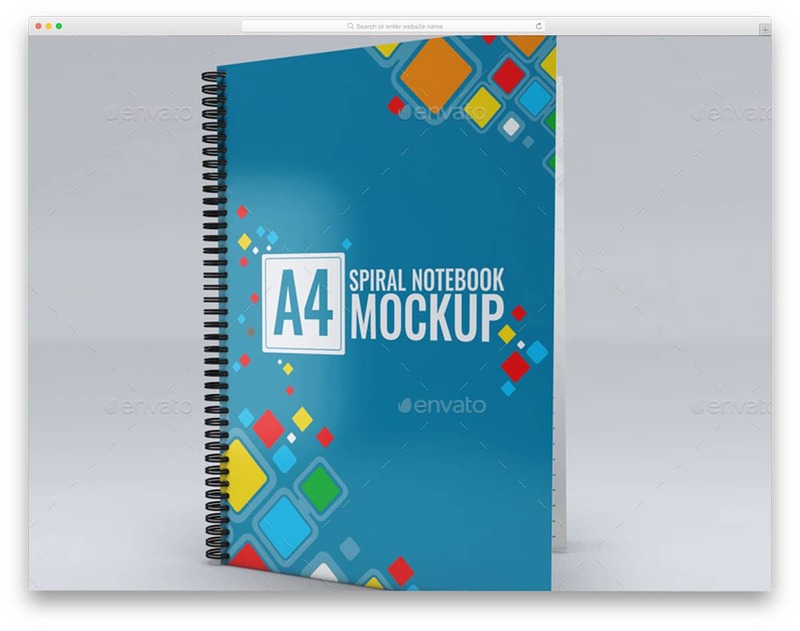 In this mockup bundle, you get 5 spiral notebook mockups. 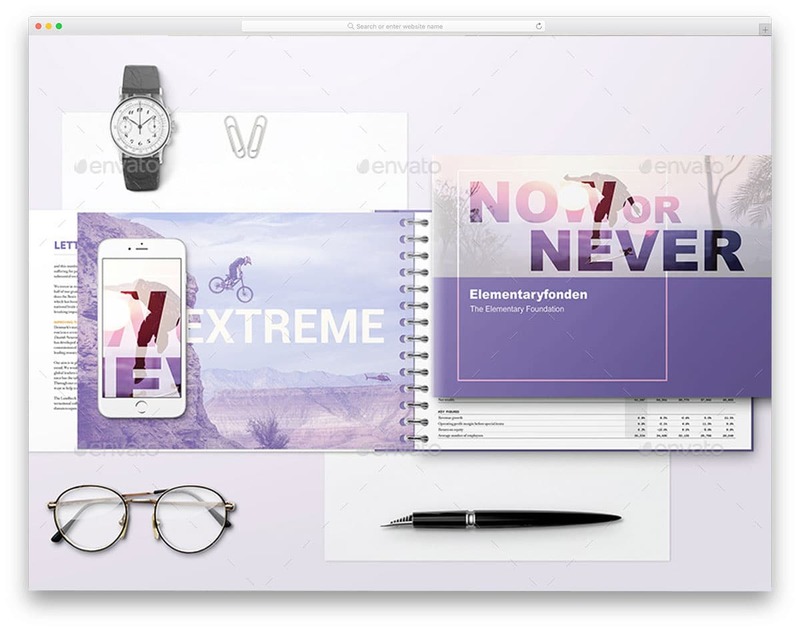 This mockup is perfect for showcasing your design and also to use in online store product images. The high-resolution images allow you to zoom in and clearly see your design details. As most online stores give zoom on hovering option, using mockups like this will help you in many ways. Each and every element on this mockup is treated as separate layers so that you can customize them easily. For example, the spirals have separate colors so you can change the color of it based on your design. Overall this mockup is a perfect option for design showcasing and also for product presentation to the users. Vertical Spiral notebooks are the favorite option for quick note taking. You can easily tear the pages once you are done with it. If you are designing one such notebook, this mockup will come in handy. This mockup also gives you numerous customization options. You can change the color of the spirals, add design to the front and back of the notebook and customize page designs. This mockup is also Amazon ready so you can create product showcase images with it. To help you add your add your logo or identity the designer gives you the option to choose a premade foil stamp on the cover. Vertical spiral notebooks are mostly used in restaurants, choosing gold foil front cover stamp for the logo will make it a perfect option for restaurants. You can be creative even on the paper holes of the spiral notebooks. The most commonly used are circular holes, but you can also use square holes and diamond shaped holes. 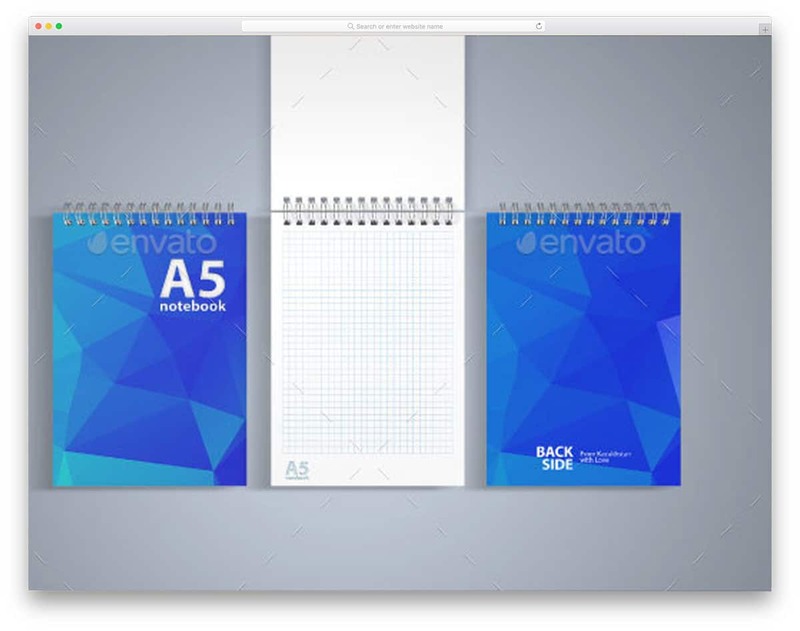 This mockup is also from the creator of the A4 Vertical Spiral Notebook Mockup mentioned above. You can expect the same design quality and designer-friendly customization options. By default, you get neutral and white color for the background. But, you can add any custom color to add richness to your design. This mockup image is also Amazon ready, hence you can use it for product image. Since it has high-resolution images you needn’t worry about zoom in on the product image. A5 Notebook Mock-Up is a simple spiral notebook mockup. With this mockup, you can showcase your design or use it in your portfolio. 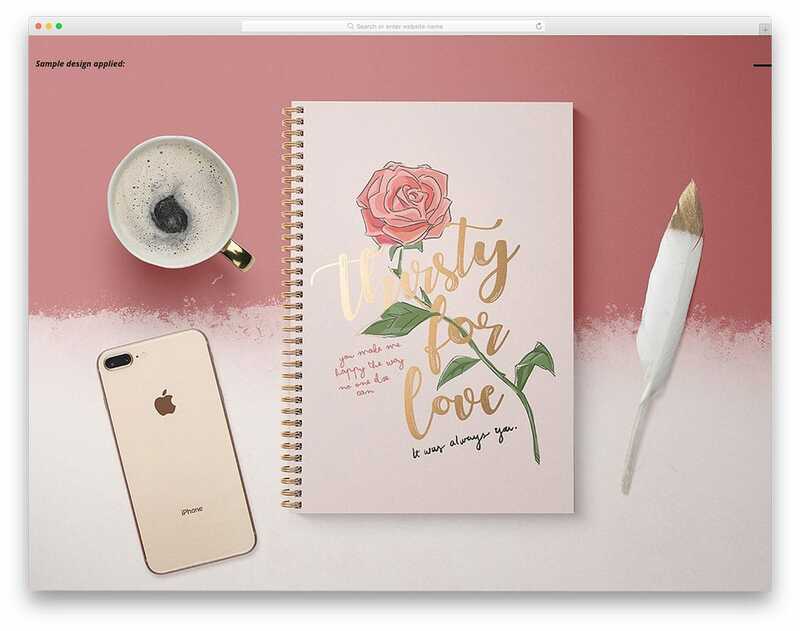 The features and the customization options with this mockup are limited when compared with the other spiral notebook mockups mentioned above. Though its features are limited it does its job perfectly and makes the available customizations easier. By default, you get a plain minimal background to elegantly highlight your design. If you wish you can add your own custom background to the mockup to add richness to your notebook design. Images with the quality of 3000x2000px are given, with which the user can clearly see your design detailing. Notebook Mockup Vol 2 is another iteration from the creator of Vol1 set mentioned above. In this mockup, you have the images shown from different angles that you haven’t got in Vol 1. Customization-wise you can expect the same quality that you have seen in the Vol1. In the download file, you get 5 PSD files and help documents. The designer of the mockup has also included the background images used in the demo for quick customization. Each element on the mockup is treated as a separate layer so that you can customize the mockup without disturbing the other elements. If you are looking for a stationary setup for your spiral notebook design presentation, this is the mockup for you. Along with the spiral notebook mockup, you also get extra properties like a, set square, pencils, and scissors. The best thing about this mockup is you can even change the color or pattern of the extra properties given in this mockup. Background images and patterns used in the demo is also shared with you in the download file. The background patterns in the download file are white wood, neutral and white color. But still, you have the option to add your own custom background if you want. The inner side of the pages is also given in the mockup to show the pages you use in the mockup. You can even use this mockup for your product images on Amazon. Spiral Notebook Set Mockup includes a simple and easy to edit spiral notebook design. The creator has given you both short and long notebook design. Smartly handled PSD layers help you to easily edit the elements. 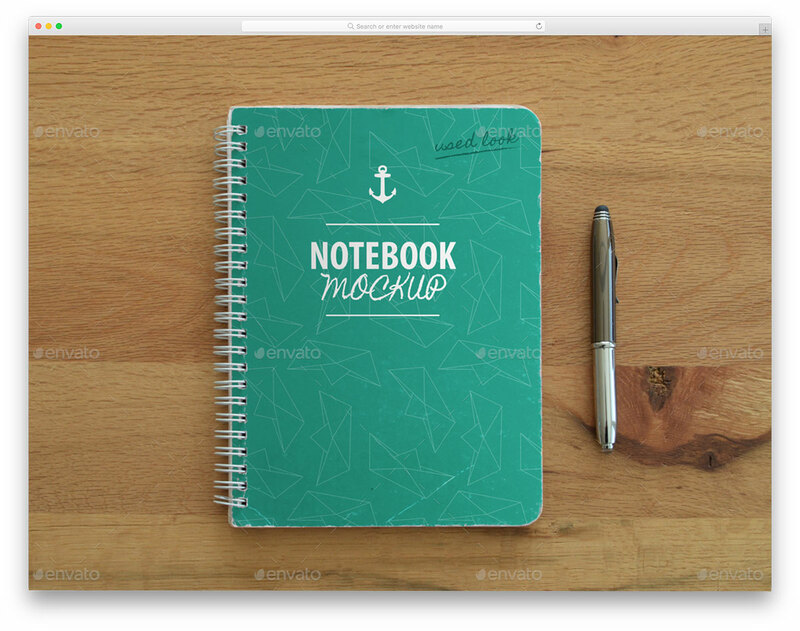 In this mockup, you can edit the background, notebook orientations, and the letterpress logo on the notebook. If you want, you can remove the letterpress design on the front and use your own design. Three PSD mockup files are given in this set and all three mockups have properly organized layers for quick customization. If you are looking for movable objects in the mockup to create a unique scene for your design, this is the mockup for you. 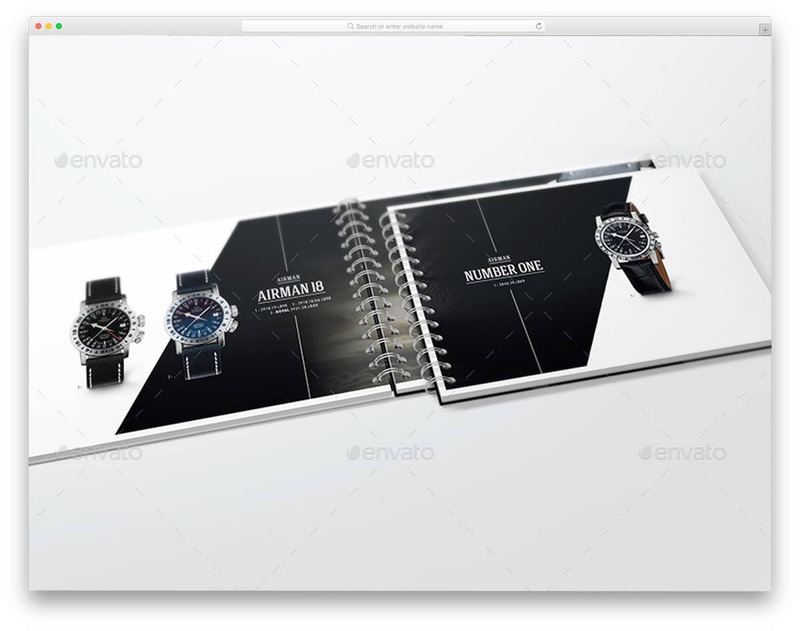 This mockup helps you create a rich design presentation. This mockup also allows you to choose and customize the foil stamp on the notebook cover. Other objects you get with this mockup are iPhones, a teacup, and a feather. All the elements in this mockup are high-resolution images so that you get a natural look out of this mockup. 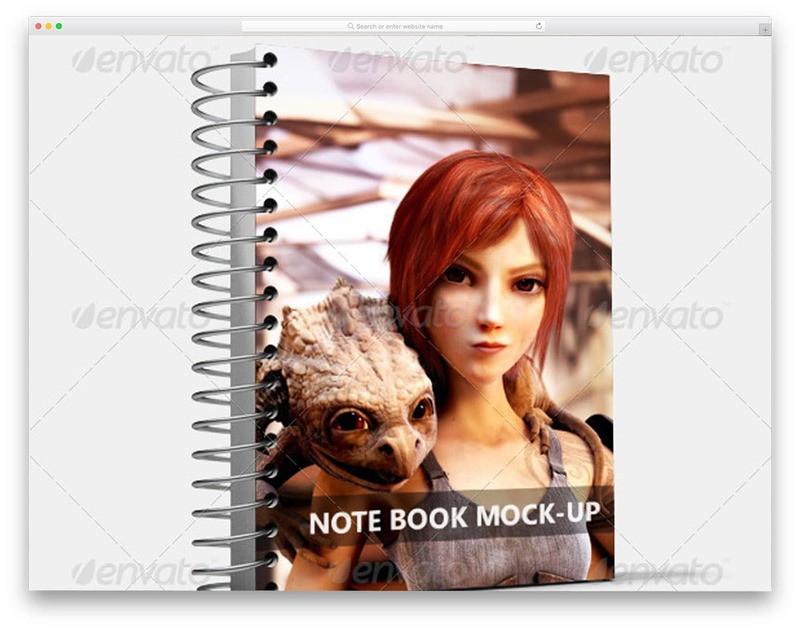 Other customization options in this mockup are spiral coil color, background, and the notebook design. Only one premade background is given in the download file, but you needn’t worry you can always add your own custom background. As told before, spiral books are one of the favorite stationery items for artists. The 360-degree foldable design of the notebook makes it easy for the artists to easily draw on the notebook. If you are making a spiral notebook design for a sketchbook, then this is the perfect mockup for you. Seven PSD files are included in the download file and each of them has different images shown in different angles. In the previous spiral notebook mockup, you have the option to choose any color for the spiral. But in this mockup, the designer has given you three color options and you have to choose one from it. 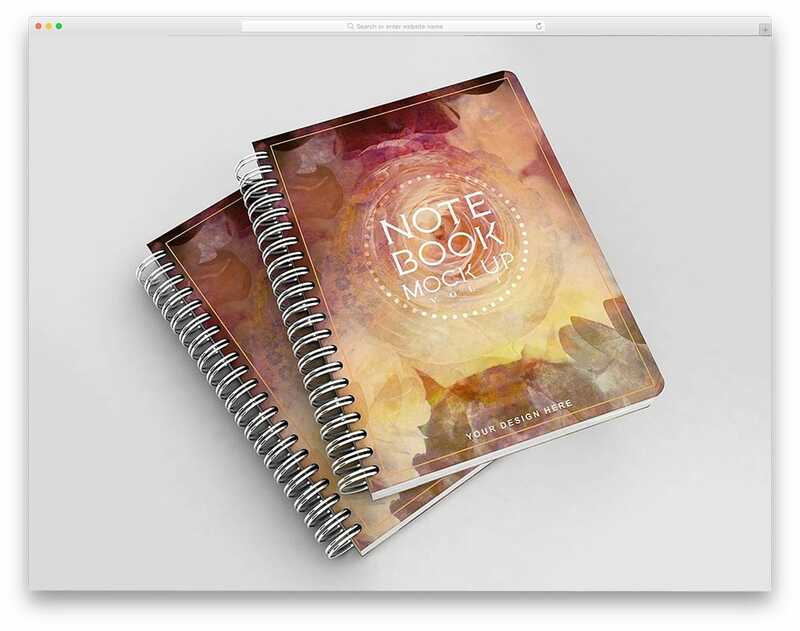 Other than that all other customization options are similar to other premium spiral notebook mockups mentioned above. A4 Spiral Notebook Mockup is a highly detailed mockup, with which you can clearly show your notebook design. Shadows and the textures of the papers give a realistic look to the mockup. In this mockup, the creator has used A4 sized notebooks so you can use this for almost all types of regular notebook designs. The reflections, lights, and the shadows are given in separate layers to help you adjust them easily based on your design. This mockup also allows you to change the spiral colors. Since this mockup uses high-resolution images, you can even use it as your product images. A5 Spiral notebook mockup is another apt choice for sketchbooks. 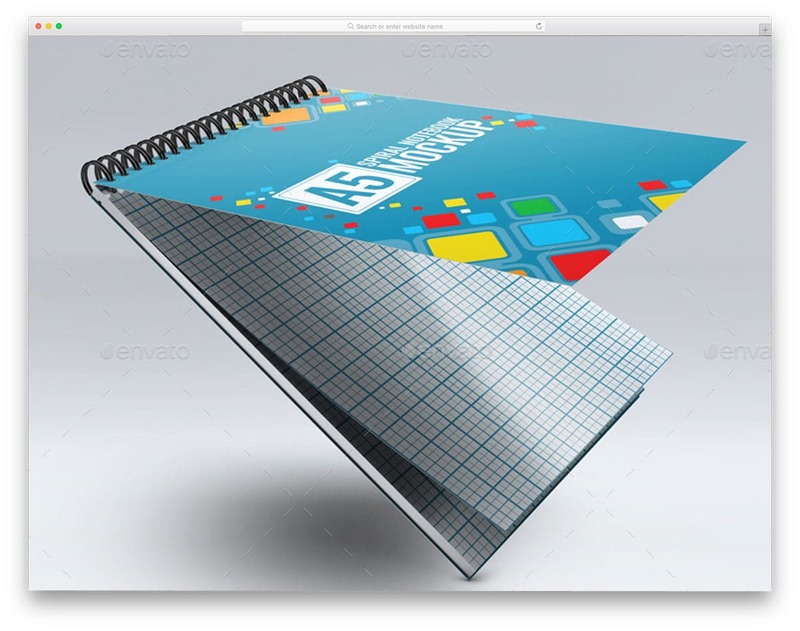 This mockup includes a vertical notebook image with softcover. With this mockup, you can showcase your front and back cover design. Along with the book cover, you also get open book image to show the paper used in the notebook. The layers of the notebook are handled smartly so that your designs fit in easily even at the curves and the edges of the notebook. In this package, you get four PSD mockup files and all of the have well-organized layers for easier and quick customization. The creator of the mockup has also included help-file in the download to help you kick-start easily. 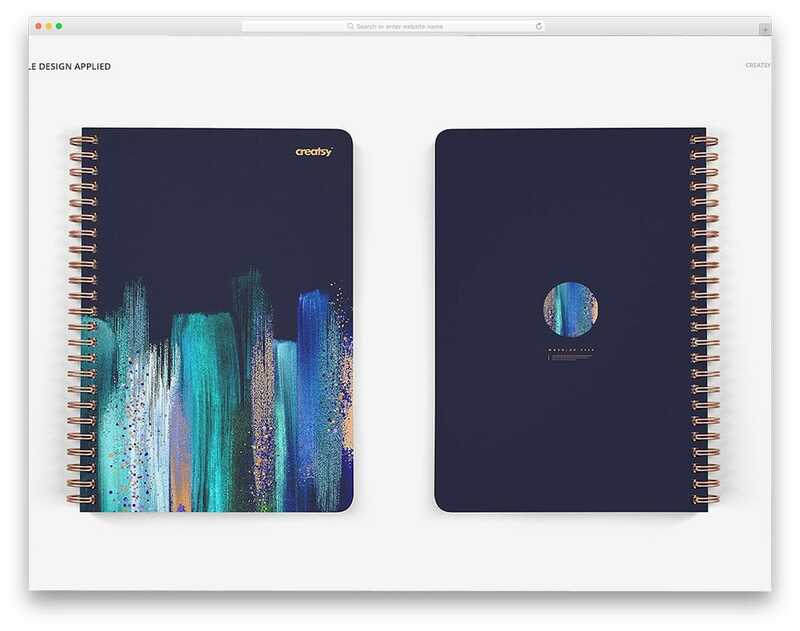 This mockup is a unique one in this list of spiral notebook mockup. 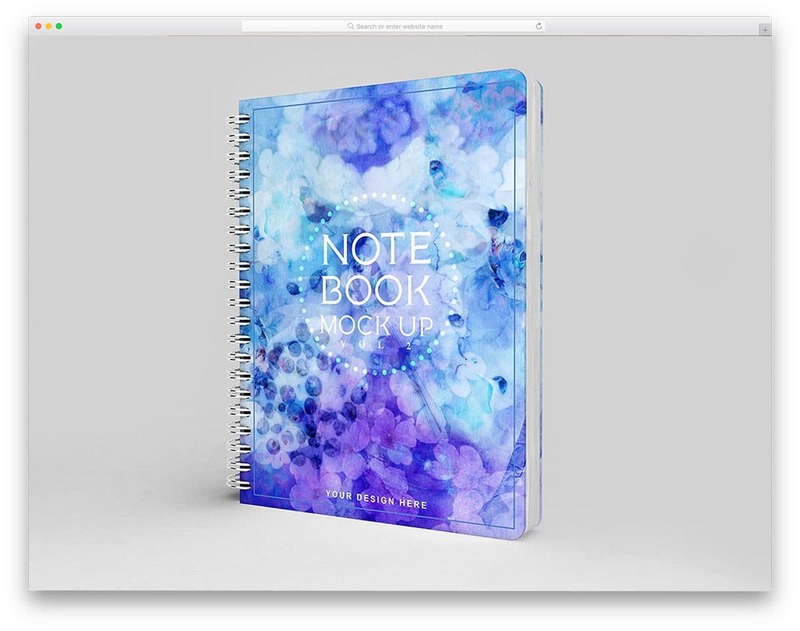 All the mockups above are designed to showcase the fresh design but this mockup has a used spiral notebook image. In any case, you are in search of this type of mockup, this one is worth the try. 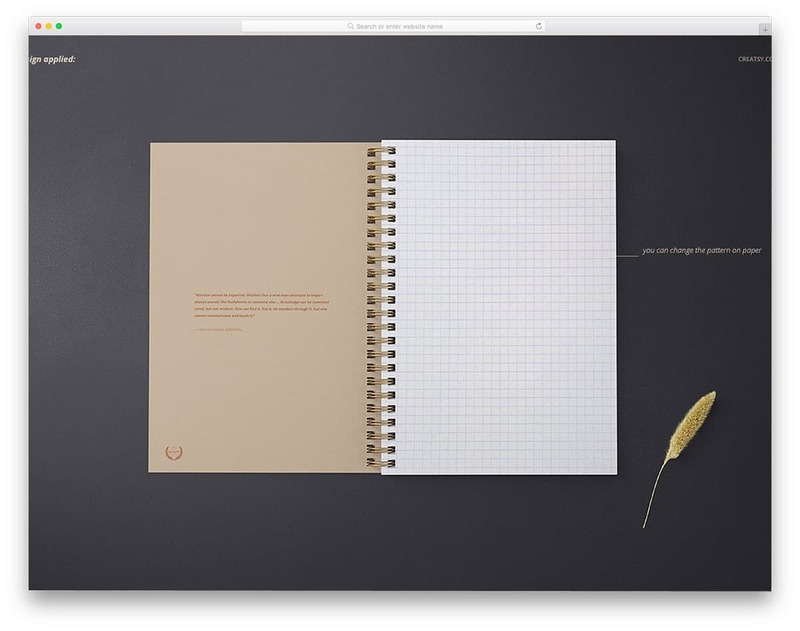 The layers of the mockup are handled smartly so that you get the aged look of the notebook. Along with the notebook mockup, this one also includes a pen. The included pen element is a movable element, keep it in my mind before using this mockup. Three PSD files are included in the download file and all of them have properly organized PSD layers for easier customizations. This is a simple spiral notebook mockup. Using it you can showcase your notebook cover design. In this mockup, you get front and the side view of the notebook. Though the perspective and angles are less in this mockup you get all the customization option. 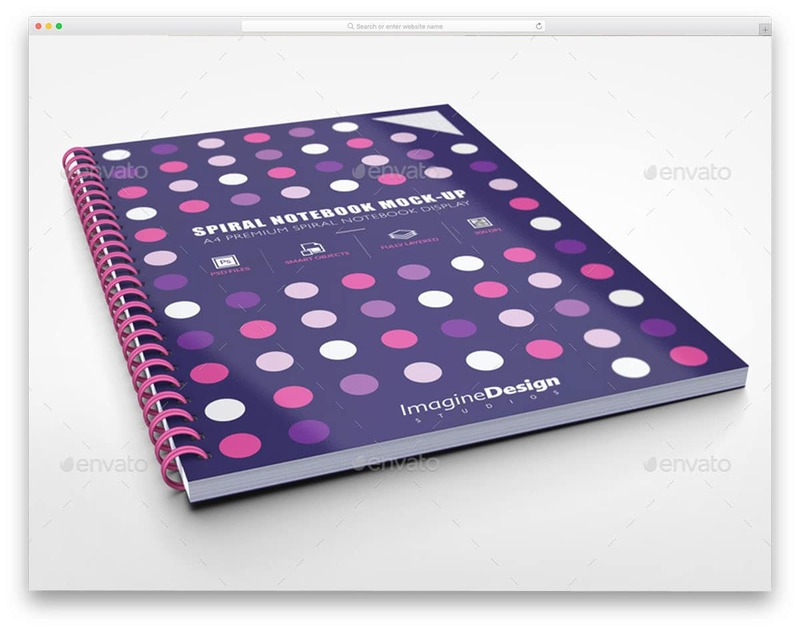 With this mockup, you can create an effective presentation for your spiral notebook cover design. The adjustable shadow effects and the depth effects will help you create a natural looking image for your book design. This mockup doesn’t include any premade background textures and images. But, you have the option to include your own custom background color or texture. 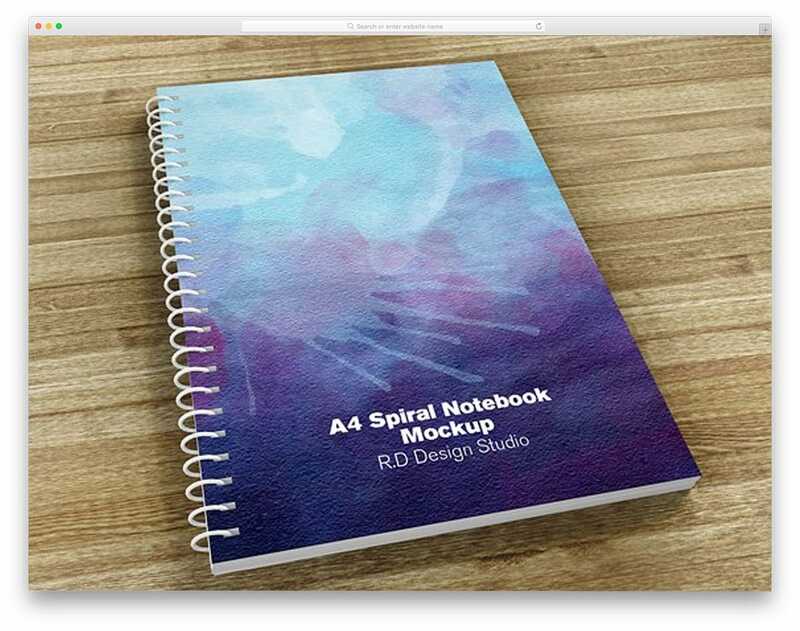 A4 Spiral Notebook Mockup is another photorealistic mockup. 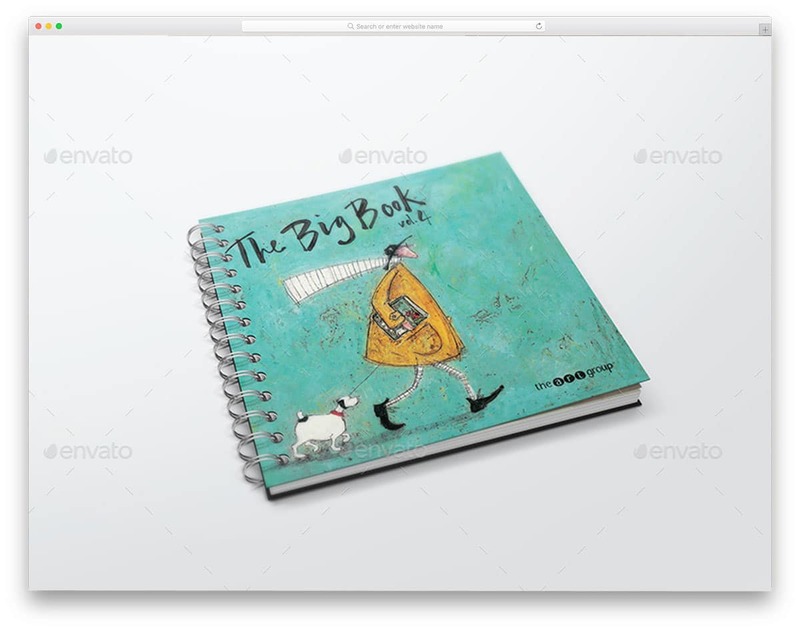 The designer of this mockup has included images of the notebook in different angles and views. Smart management of PSD layers retains the characteristics of the paper and the spiral cover neatly. This mockup provides you 12 PSD files and all of them have a realistic 3D image. All the layers are created sensibly so that your design fits in well even on the curves and the bends. Since it is 3D composed file, you get a high-quality image with this mockup. Without any hesitation, you can zoom in and show your design details clearly to the users. This mockup is almost similar to the A5 vertical spiral mockup mentioned above. The only difference is this mockup uses a thick sheet for the notebook cover. Thick covers will help you easily rest the paper and can write or draw on it easily. This one is also a 3D rendered image, so you get realistic output from this mockup. Nine PSD files are included in the download file and you also get help document to start easily. Each layer is treated carefully so that you can customize almost all the elements in this mockup without disturbing other elements. The images of this mockup allow you to zoom up to 100% without breaking the image quality. If you are creating professional looking corporate stationaries this mockup is the best option. The designer of this mockup has used a high-quality image so that all the details are caught perfectly. Another best thing is that the designer managed to preserve the details in the layers so that no matter what type of design you use on it, the natural look of the image is preserved. Glossy plastic spiral coils are used in this mockup and the reflections on it are preserved well in the PSD layers. Customization-wise you can edit almost every element in this mockup without any issue. 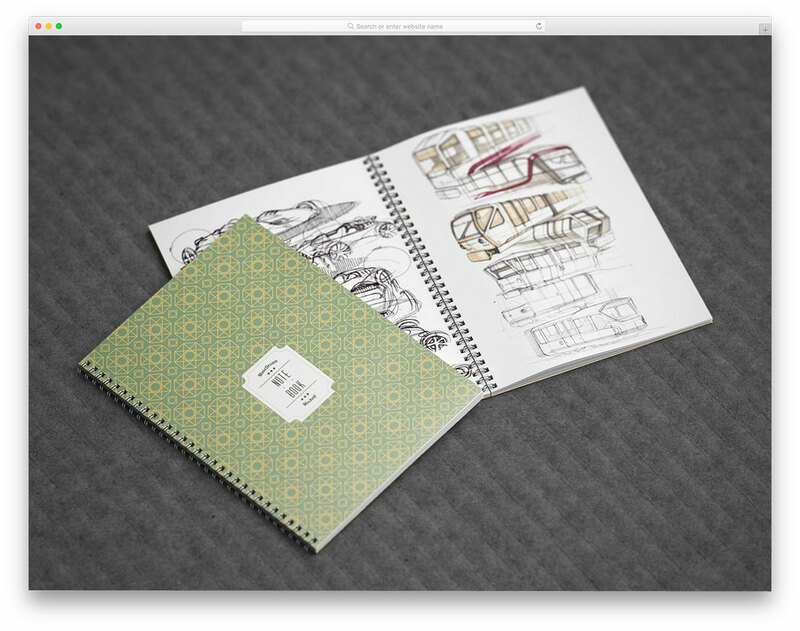 As the name implies this mockup includes a catalog book, but this mockup can be used for other types of notebooks as well. The designer of this mockup given you complete freedom to customize everything in this mockup. Square shaped notebooks are used in this mockup so it is apt for all regular users and all products. In the download file, you get nine photorealistic PSDs and all of them have high-resolution images which are easy to edit. In all the nine PSD files you can customize the background, color of the spiral coils, book cover design and the depth of field. Overall this mockup is a perfect option to showcase your design. Since it is a mockup bundle you get numerous mockups in one set. If you are a digital agency or professional designer, this mockup will come in handy for you. The pricing of this mockup bundle is cheap when compared to other mockup bundles so that everyone can afford it. 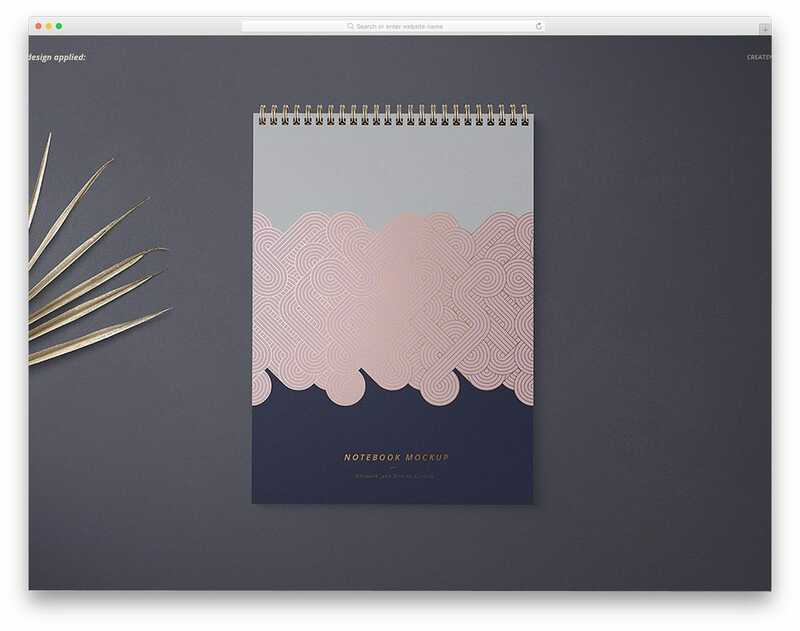 In this mockup bundle, you get 38 PSD mockups and all of them have spiral notebook images. All famous sizes and orientations are given in this mockup to make it a one-stop solution for all your presentation needs. All the PSD files have properly organized layers and each element is treated as a separate layer for easier customization. This is another mockup bundle, but it has only hardcover notebooks. With this mockup, you get 21 PSD files. Since the mockup count is less than the previous mockup bundle the pricing of this bundle is a bit lesser than the previous one. The designer of the mockup has included both normal sized books and the books in landscape orientation. All the customizations are almost similar to all other premium spiral notebook mockups mentioned above. High-resolution images of 300dpi are used in this mockup hence you can clearly show your design details with this mockup.